Review written by and copyright: Rick Curzon (18th January 2019). Two warring elderly brothers and their respective heirs are determined that each will outlive the other in an attempt to hold onto the family fortune, and will stop at nothing – even murder – to achieve their goal. A series of comic events with a macabre spin as bodies of deceased members of a Tontine get delivered to the wrong addresses. 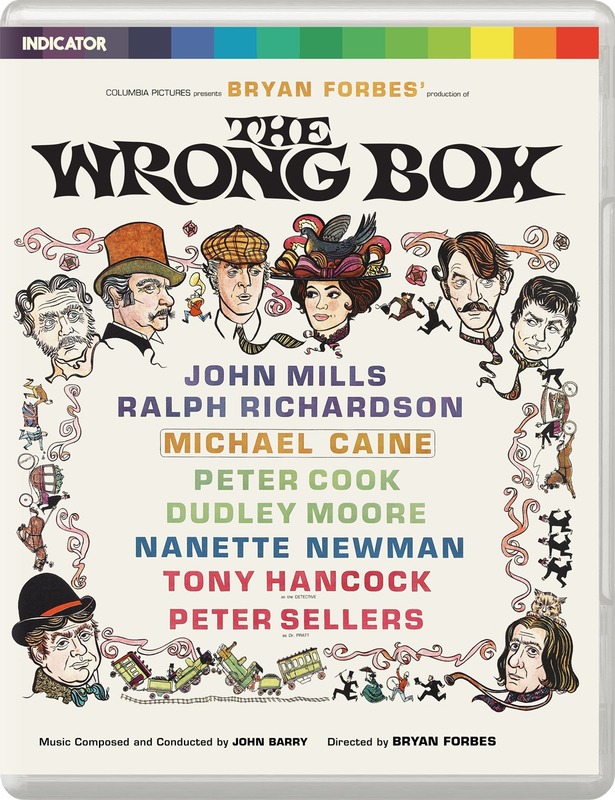 Very agreeable, and very British, comedy packed to the gills with recognisable talent fronted by Michael Caine and Nanette Newman. Wilfred Lawson is my favourite as Peacock, the butler. Fabulous score by John Barry with a very memorable theme. Hugely entertaining comedy from Bryan Forbes. The image is typical of a UK-lensed production of the 1960s with a rich colour palette, plenty of lovely grain and texture; a very filmic look and feel. As is usual for the period there are density changes where the image becomes softer as opticals are used. The overall look is soft, with fine grain but detail and textures are strong in closeups, medium shots and in backgrounds. The grain is ever present and is at it’s coarsest in darker interiors but is also very noticeable in some exterior shots. Black levels are rich and deep but shadow detail suffers from occasional crush. I suspect that much of this will be down to lighting conditions during production. Contrast is good and doesn’t allow for blown out whites or eclipsing detail. There are no signs of digital artefacts but when I scrutinised the image up close I did see the odd sign of print blemishes or damage but they’re not very noticeable. The encoding is up to the usual high standards set by Powerhouse’s other Indicator releases. As good as can be shy of a 4K UMD disc and a brand new 2018 transfer. We have a generous bitrate and the usual roomy BD50 disc. Sound is a standard English LPCM mono track typical of the period. Nice clear dialogue reproduction and the score comes through clearly and when required without ever stepping on the dialogue. No distortions beyond what you'd expect of a track with limited range and no signs of hiss, pops crackles etc. Subtitles are essential for the hearing impaired and welcome. Fact filled commentary covers pretty well everything you could want. Both commentators are film historians and fans of this film so you're in good hands. I have yet to hear a dull or weak commentary from Powerhouse Films. Forbes was a mainstay, some might say royalty of the UK film world. An erudite man who started out as an actor and became a noted director and producer. He covers his career and the film buSiness. Leading lady - and Forbes' widow - on the film, her career and being married to Forbes. Informative if brief interview with assistant editor Willy Kemplan. Another fairly brief piece interviewing assistant director Hugh Harlow. Standard promotional trailer of era. Decent HD still gallery of promo material; what it says on the tin. Another exhaustive booklet filled to the brim with contextual material. As usual the booklet is worth the price of the disc by itself. Another stellar release from Powerhouse Films of a largely forgotten British classic. Picture and sound are as good as can be given the age of the source and a new 4K restoration. This uses another excellent off the shelf master from Sony and the topnotch encode makes the most of it. Extras are also top drawer ... as usual!